The project was undertaken by North London company H&H Audio Visual. 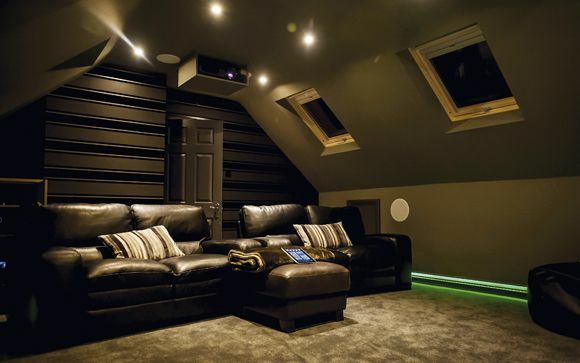 Earlier this Summer, it won the new 'Best Media Room Under £10,000' category at the CEDIA Awards. As befits an authentic media room, attention to detail has been paid to keep kit discrete and operation simple. The owner wanted to be able to switch from daytime office to nighttime cinema at the touch of a button, and that's what he got. There are two displays in the system – a 6 Series 55in Samsung LED flatscreen and a 101in projector screen from Impact Screen Solutions. For bigscreen movie action, the motorised screen descends from its ceiling housing, driven by a 12V trigger and the Savant control system. Even better, operation is synced to the Rako lighting array – as soon as the screen is selected, LED lighting in the room dims automatically, ensuring the best image from the Epson EH-TW6100 projector. Surround sound is delivered by a KEF speaker array. Bookshelf C Series models are housed in the bespoke front-wall cabinet for front/left right duty, with white grilles to match the room's decor. The centre channel is also from the C Series. Mounted below the TV, it becomes hidden from view when the projector screen is down – hence the need for acoustically transparent material. The surround speakers are wall-mounted KEF E301s, with their egg-shaped enclosures providing a neat visual match to the room's freestanding lamps. A vertical-standing T Series subwoofer provides LFE. Loft spaces typically throw up installation challenges, and this room was no different. The vaulted ceiling and chimney breast, plus the owner's other requirements, limited speaker placement flexibility. This is one reason why the Marantz SR5009 AV receiver, which features Audyssey MultEQ XT room correction, was specified. This 7 x 100W home cinema hub is also ready for 4K sources, should the owner want to upgrade his equipment in the future. A further reason the installers opted for the Marantz was its tried and tested Savant programming profile – choosing kit with integration in mind, says H&H, cut programming and installation times (the total hours of the build was 26) and kept the project under budget. And it's this control system that ties the whole room together, even incorporating the office PC as a source (alongside a Sony BDP-S5100 BD deck and Apple TV).